Set out a 3-foot by 3-foot square in a spare space in your backyard. Cover the area with a thick layer of dry leaves or straw to a 4-inch thickness. Add a 4-inch layer of material full of nitrogen such as coffee grounds or manure. Over that add a half-inch layer of blood and bone. Continue to repeat steps 2 to 4 until the whole thing is 3 feet high. Leave the whole thing to decompose. Turn it all over once a week at a minimum and no more often than every three days. It is ready to use when it composts into a dark, crumbly, sweet smelling soil. This soil is ideal for growing your cannabis plants and for making your own fertilizer. Get out a tarp or kid’s swimming pool. The swimming pool is a great option as it will contain the material to mix it. Put in a 1-inch layer of your organic fertilizer across the bottom. Scatter a scoop of mycorrhizae (a fungus) and coco fibers across the top. Cover with another 1-inch layer of your homemade soil. Spread 1 kilogram of bat guano over the top. Add another 1-inch layer of soil. Next add 1 kilogram of steamed of bone meal. Mix everything together with a spade. Fill garbage bins to three quarters full with the mixture. Fill each garbage can with around 2½ gallons of water. Leave to sit in the sun for 30 days. After 30 days it turns into liquid fertilizer for use on your growing cannabis crop. 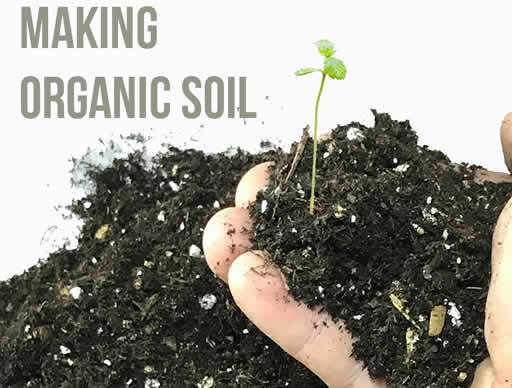 Making your own organic soil. Now you can see how easy it is to make your own organic soil and fertilizer, get out there and try it for yourself where legal. Some great strains can be found here.